Although hollandaise sauce is amazingly good, it is a guilty please given that it has a half a cup of butter in it. While I was enjoying the asparagus with a poached egg in hollandaise sauce earlier in the week, the lemony nature of the sauce reminded me of another lemony sauce, avgolemono sauce . An avgolemono sauce is a Greek egg and lemon based sauce that is really tasty without all of the butter. In addition to the egg and the lemon juice, avgolemono needs a liquid and that liquid is commonly the liquid of dish that you will be adding the sauce to, though you could always use a broth or a stock. Since I would be serving my avgolemono sauce on asparagus I used the water that I cooked the asparagus in as the liquid in the sauce. Normally an avgolemono sauce would be finished with this but I commonly associate dill and capers with lemony sauces and I could not resist adding some to this one. Of course you can turn this from a side dish to a light meal that is perfect for breakfast or brunch by topping it off with a poached egg. Cook the asparagus in boiling water until it just turns dark green, about 2 minutes. Drain the water, reserving 1/2 cup of it. Rinse the asparagus under cold water to stop the cooking process and set aside. Whisk the egg in bowl until frothy. Slowly whisk in the lemon juice followed by the reserved asparagus water. Swirl the water in the pot. Crack an egg into a bowl and pour the egg from the bowl into the water. Repeat for the remaining egg. 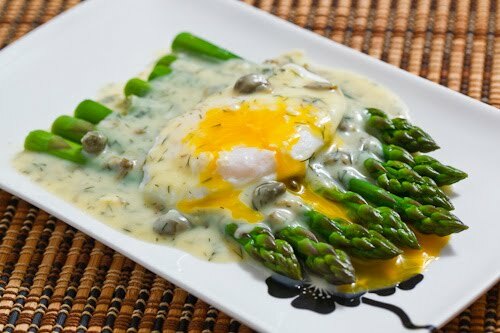 Split the asparagus between two plates, top with the poached eggs and the dill and caper avgolemono sauce. This looks fantastic without being too "guilt-inducing." Will have to try it for lunch! A terrific combination! I love that addition of Avgolemono sauce. Perfect! your pics are totally awesom! Dill and capers are a fabulous addition to the avgolemono sauce. That second picture is absolutely fabulous! Yesterday I spend few hours with your blog. It's the BEST. Congratulation. Fantastic!! Wow, looks so good. I really, really need to try asparagus with a poached egg. Your pictures are mouth watering! I'm so glad to find out about the avgolemono sauce! I had never heard of it, and it sounds right up my alley. Really nice photos in this post! 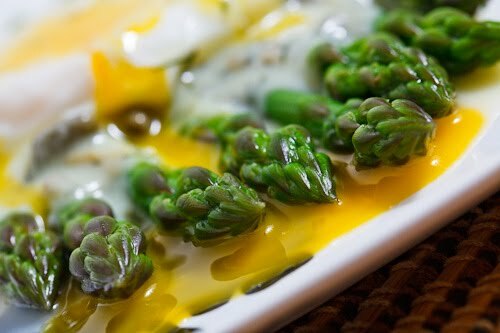 What a great idea for a sauce for asparagus and egg; challenges hollandaise for sure! I have never seen an avgolemono sauce before, what an awesomely delicious alternative to hollandaise! Beautiful photo too, the asparagus tips are literally popping out of the screen! Great sauce. It looks just as delicious as the hollandaise. room-mate and me tried out your recipe for Sunday lunch and it turned out yummy !! Thanks for the recipe. wow, that first photo is really amazing… i love it! Today I wondered whether Greek Avgolemono Sauce and Hollandaise Sauce are the same thing.